President-elect Donald Trump's pick to lead the Environmental Protection Agency, Oklahoma Attorney General Scott Pruitt, testified today at his confirmation hearing on Capitol Hill, telling lawmakers that climate change is no hoax and acknowledging that human activity is a contributing factor to the phenomenon. "Science tells us that the climate is changing and that human activity in some manner impacts that change," he told the Senate Environment and Public Works Committee. "The ability to measure with precision the degree and extent of that impact and what to do about it are subject to continuing debate and dialogue, and well it should be." Responding to one senator's question about whether he agrees with Trump's declaration that climate change is "a hoax," which the real estate developer tweeted in 2014, Pruitt said, "I do not believe that climate change is a hoax." In November, though, Trump told The New York Times, "I think there is some connectivity" between human activity and climate change. Pressed later by independent Sen. Bernie Sanders of Vermont on the controversy, Pruitt said, "I believe the ability to measure with precision the degree of human activity's impact on the climate is subject to more debate on whether the climate is changing or whether human activity contributes to it." "So you are applying for a job as administrator for the EPA to protect our environment, overwhelming majority of scientists say we have got to act boldly, and you're telling me that there needs to be more debate on this issue?" Sanders went on to ask. "No, senator, as I've indicated, the climate is changing," Pruitt said, declining to offer his opinion on the matter, saying his personal position is "immaterial." Pruitt, 48, a lawyer and Kentucky native, has argued that global warming is not a scientifically settled phenomenon. "Healthy debate is the lifeblood of American democracy, and global warming has inspired one of the major policy debates of our time," he wrote last year in a National Review opinion piece. "That debate is far from settled. Scientists continue to disagree about the degree and extent of global warming and its connection to the actions of mankind." He also told lawmakers today that his role at the EPA would be to "make things regular" as the administrator of the nation's environmental regulations and that he believes the EPA plays a vital role in ensuring water and air quality and in enforcement on matters that cross state lines. Trump, in a YouTube video announcing his priorities for his first 100 days in office, pledged, "On energy, I will cancel job-killing restrictions on the production of American energy, including shale energy and clean coal, creating many millions of high-paying jobs." 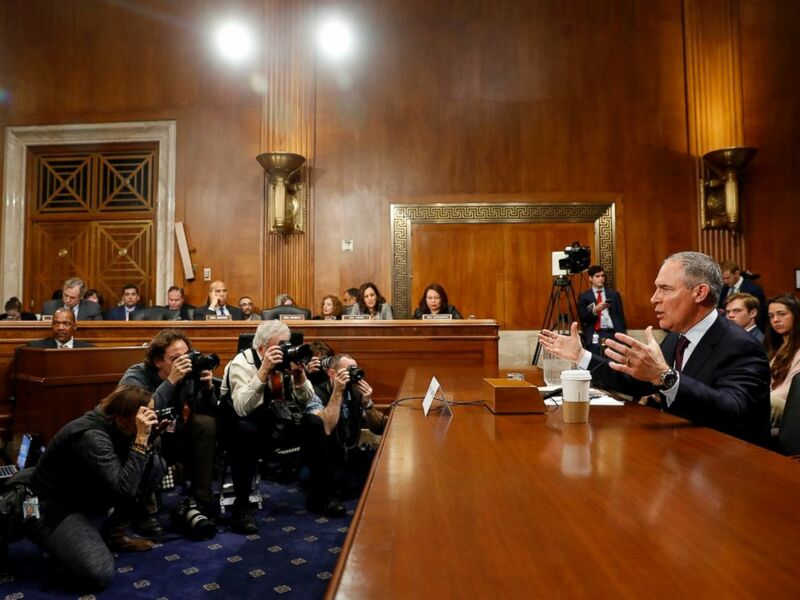 Oklahoma Attorney General Scott Pruitt testifies during his confirmation hearing before the Senate Committee on Environment and Public Works on Capitol Hill, Jan. 18, 2017, in Washington. Pruitt also received tough questioning from Democrats over his multiple suits against the EPA (some of which are still active) and his connections to the oil and gas industry. On pending litigation, Pruitt said he had "every willingness" to recuse himself from active suits at the direction of EPA lawyers. That pledge fell short of appeasing some Democrats, who say he should take the initiative to recuse himself to avoid any potential conflicts. Sen. Jeff Merkley, D-Ore., today presented a blown-up copy of a letter that Pruitt sent to the EPA as Oklahoma attorney general that was heavily drafted by oil company Devon Energy. “Why do you need an outside oil company to draft a letter when you have 250 people working for you?” Merkley asked. "That was an effort that was protecting the state's interest in making sure that we made the voices of all Oklahomans heard on a very important industry to our state," Pruitt replied. "But you only sent it on behalf of a single voice, the oil company," Merkley shot back. Pruitt also responded to a question about the water crisis in Flint, Michigan, where residents continue to grapple with the fallout from contaminated tap water. "As you know," he said, "under the Clean Water Act and the Safe Drinking Water Act, if there's an emergency situation, the EPA can enter an emergency order to address those kinds of concerns. I think there should have been a more fast response, a more rapid response to Flint, Michigan." Sen. Tammy Duckworth, D-Ill., followed up on the Flint question later in the hearing, asking Pruitt whether he had studied what happened in the city. Pruitt said the EPA holds a degree of responsibility for the water crisis there, adding that the agency needs to be "proactive."